What will the next step in the evolution of visual expression bring? How will cameras breathe life into the imagery of tomorrow? 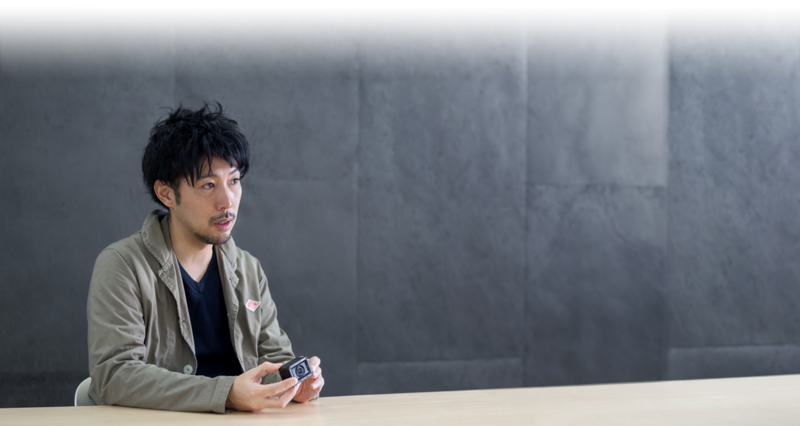 The story behind the RX0 began as a quest to find answers to those essential questions. The development team had clear objectives. They wanted to give every creator, professional or amateur, exactly what they needed to act on original inspirations and explore new worlds of visual expression. They wanted the camera to be a source of inspiration, too, one that could catalyze new ideas into being. To make good on those goals, the developers knew the camera had to liberate creators from all possible limitations—the restrictions of space, time, and environment. For the RX0 team, that meant combining a 1.0-type image sensor—a product of the RX Series, delivering pristine image quality in a small package—with a robust, waterproof design that'd stand up to bad weather, underwater settings, and other harsh conditions. And there was one more thing: making the camera as compact as possible. 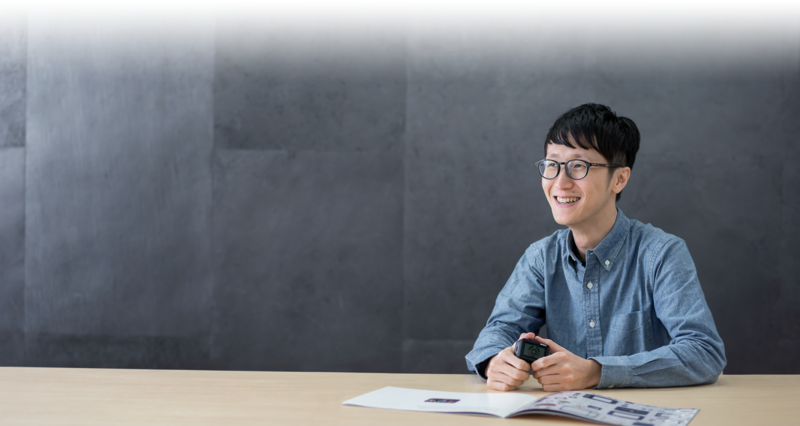 With their course in place, the designers set off to create a camera that would both embrace the RX Series identity and open new eyes for compact digital cameras. To create new forms of visual expression, we knew the RX0 had to eliminate all the limitations that conventional cameras put on creators. It was about more than just the image quality. By giving users as much shooting freedom as possible, we wanted to highlight the RX0's infinite potential for turning any idea into an actual image. To create a new product, a team needs process for sharing a vision and turning it into reality. 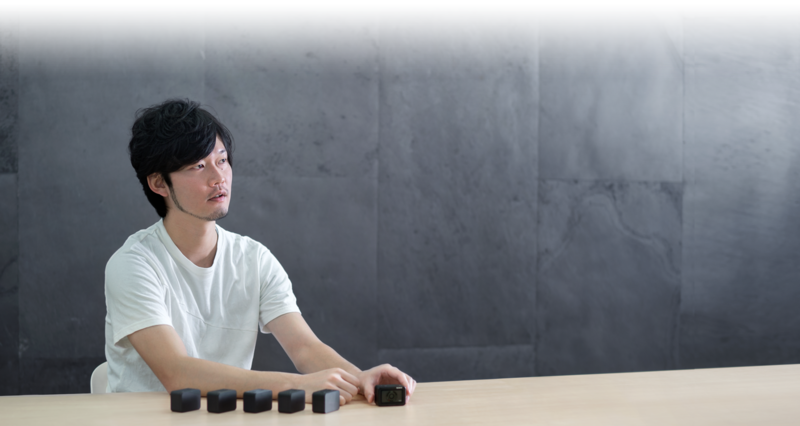 While the engineers were giving shape to the RX0, then, the communication designers were creating a video to depict the new forms of visual expression that the RX0 would unlock. What the video did was unify the overall vision; it gave the planning, engineering, and design segments an actual visualization of what they were trying to accomplish. That laid the foundation for dynamic synergy, with the different groups fusing their expertise into a single product. That initial visualization process would prove instrumental in imbuing the overall communication design, of course, as well as the product catalog, website, event displays, and everything else, with a consistent concept. The catalog, which presents a moving, dynamic subject in a single still frame bursting with vitality, showcases the versatility of the multi-angle approach. At IFA, the world's largest consumer electronics trade show, the core elements of the team's communication design shined through to reflect the quality of the camera—and the story informing its overall worldview—by using 26 75-inch monitors to represent the unique visual diversity of the multi-camera setup. For the RX0 communication design, we wanted to present a new form of visual expression and really tap into the personality of the product—the essence of the camera and the developers' vision. By giving that sense of value and meaning a visual component, people will get an idea of what the RX0 is all about. Designed to be an "eye" with the power to capture exactly what creators are envisioning, the RX0 places the lens at the center of the housing and the tripod mount directly under the optical axis for solid, versatile camera functionality. To cover everything from simple snapshots to full-on studio photography, the camera uses a 24-mm (35-mm equivalent) single-focus wide-angle ZEISS® Tessar T* lens for optimal versatility, high-resolution performance, and minimum-distortion results. While compact cameras often skimp on design elements, the RX0 defies that trend. Around the body, a machined block of metal, the camera features anti-slip ribbing that doubles as a heat-release medium, while the overall shape symbolizes the quality of the RX Series and a distinct toughness. To find the best possible design for the ribbing, which not only adds an aesthetic beauty to the product's visual identity but also increases the camera's total surface area to enhance heat-release performance, the team tested a wide range of variations on the cross-section configuration. How can cameras function as systems in the digital age? The RX0 is one unique, innovative answer to that question, too. 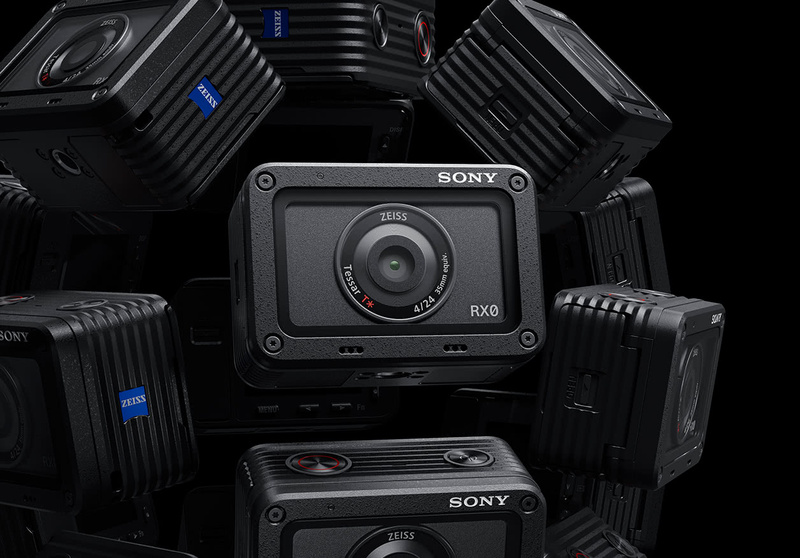 Instead of limiting usage to single-camera setups, the RX0 gives users the ability to shoot in perfectly synchronized multi-camera arrangements with a Camera Control Box (sold separately). The key to any effective multi-camera setup is pinpoint alignment; each camera has to be in the optimal position. That's why the design team made a point of keeping the lens at the center of the body. 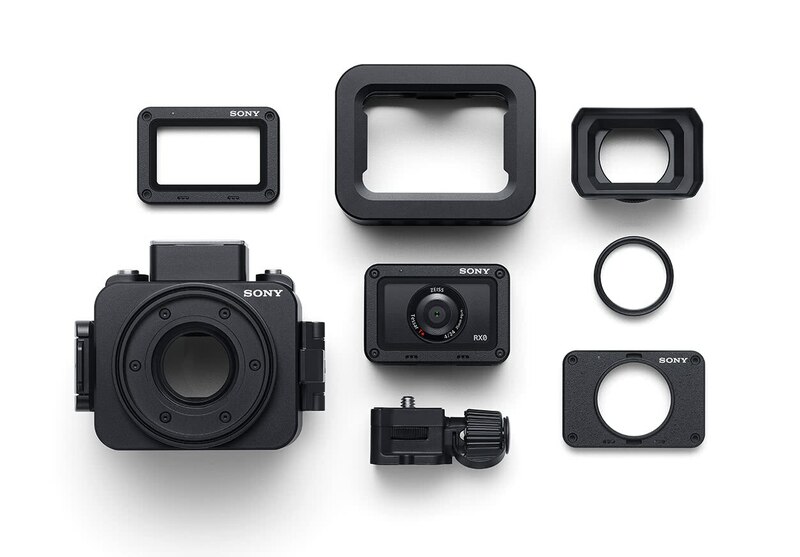 Whatever way the user wants to orient the cameras, be it horizontally, vertically, or even upside down, the RX0 design makes it easy to set up precise layouts without the need for any time-consuming alignment tweaks. The features go deeper than just the lens, of course. Broadening the RX0's impressive range of expressive freedom are its housing—waterproof down to 100 meters—and adaptor, which lets users mount the various filters they need to get the different looks they're after. Right from the beginning, we had this idea of enabling multi-camera setups. To give users what they needed to experiment with new, one-of-a-kind shooting experiences, we focused on making the camera unit as small as possible—but still effortlessly usable—through prototyping and field tests. When you combine your ideas with the dazzling potential of the RX0's myriad features, you can portray a single subject in virtually any way imaginable. A camera shouldn't hold creators back—it should liberate users to pursue their inspirations wherever they lead, letting every photographer's unique, personal vision run free. The RX0 is here to unlock those new forms of visual expression—a companion for every creator to treasure.